I've been pondering lately, whether to let my blog simply die out or to continue. I've been on this tab numerous time, each time opening and then closing it even before I pen the first few words but once I start I guess it's easier to go on rather than stopping down. I am fine, to all of you kind souls who left me messages asking if I am alright, I am very fine ^^ Just been buried by lots of things lately and it dreads my inner guilt that I have not been visiting each of your blog for close to a month. I was a bit 'star struck' truth be told and it's not easy to keep up but here I am, my faith renewed and my energy flowing back to me >D Thanks to all of you so much who has been telling me to not stop doing something that I enjoy. Lately there has been multiple issues that has been popping out and making me think, something thatI don't do often which requires the using of my head to think. I have a slight split personality: I either let go completely and just go with the flow for a period of time and at times I just wake up in the middle of this cold reality and I make a sudden decision where there is no turning back. It's tiring to even keep up with myself because at times I don't know what I want or I know what I want but I cannot get it so it's frustrating. Life does not hand you everything that you want in a plate decorated in gold. In fact it comes in broken pieces at times and you have to fix the pieces and it comes down to whether or not you are able to fix it and get a complete plate or, you leave it hanging and uncompleted. 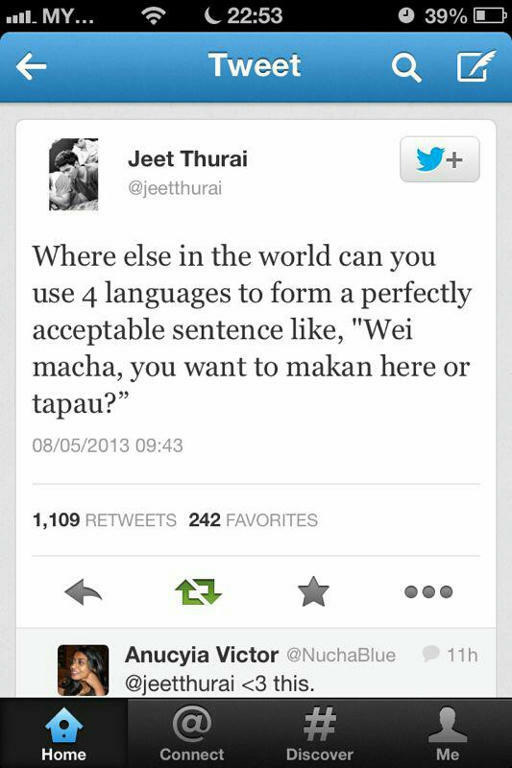 "Wei" is the Chinese slang of "Hey"
"Macha" is the Indian slang of "Bro"
"Makan" is the Malay slang of "Eat"
"Tapau" is the Chinese slang of "Take away"
Our blend of unique culture does not stop here. We, regardless of our race, we have often extend our hospitality to foreigners. We practically worship foreigners lol be it you are from Europe, Middle East or Asia itself, we see you we are automatically nicer to you and we itch to start a conversation with you because we are curious creatures with the exception of taxi drivers >D They see you they see dollar sign on your face hahaha. Recently, the election that falls on 5th May 2013 could be considered as one of the historical turn of event in Malaysia's history. Many years back, not many people cared about politics or the ruling Government. We were blind, shadowed in the dark. We merely follow the direction of that dim light that was shown to us, totally oblivious to what is happening in the dark around us. For the first time, we have fully utilize our four senses to hear(ear) what the ruling party and the Opposition has to say, see (eyes) for our own eyes what has been done, not been done or what has been fabricated, investigate via social media or papers of the propaganda (touch) and share (mouth) by word of mouth among friends and families. We have never once stand so united and this is the start of something new. "We" in this context means everyone from all age of lives: Even those who are not of age to vote to as old as a 90 year old Grandmother. I would not term this as a revolution but rather a wish for a change and with every want of change, there is an equal want of NOT to change. There are always two sides to a coin. Whatever we have, always remember that the other side has it. Perhaps even more. We could stand united with this 4 senses, we could harm with this 4 senses too. Each side has their own good and bad, there is no one ruling party being the perfect one without any shortcoming. Everything comes with a shortcoming. Heck, even a mechanical device comes with shortcoming, e.g. poor battery life despite how brilliant it is in every other performance. Racial tension has never been stronger, but racial unity is not losing out at all. If we can extend our courtesy to a foreigner who is not even from this land, we should go the extra mile and extend even more to our own fellow country mates because after all, we are all from this same piece of land we call as home. For those of you from the opposition, you may not have won this election but hey, you've made a change. You've spoke out for yourselves, let your voices be heard. You are no longer this small humming sound running in the background but you are standing in the spot light right now and your every voice and breath is heard loud and clear. For those of you from the ruling Government, you have won this election but hey, you cannot ignore the voices of the masses anymore. If you want to stay in the sandbox, you've got to learn how to share that one same sandbox with the other big boys who has come to join in the game or you are in for a bad time. As for myself, a word from me to me: No one knows what the future holds. better a tug of war election than a violent one. ours will be held this coming week. hope it's gonna be peaceful. aww sweetie! well I'm glad to hear you're okay :) please keep blogging, you're such an awesome edition to the blogosphere! We love you! this was a really interesting post, that tweet is hilarious and so fascinating! I didn't know these things about Malaysia - that you have 4 main cultures all living together! That's really awesome that you're exposed to different experiences every day - and delicious FOOD! I think racial tension is just one of those human things, especially when there are elections and social upheaval. Some want change while others rage against it (they're usually the ones that have been sitting pretty for so long) but the way the world is now - so globalized - I'm starting to think race is just an excuse to do horrible things and to try and make everything stay the same. whoa! totally agree with what you wrote!! and a lot of people is sharing about that twitter pic too!! anyway, i've nominated you for the Versatile Blogger award! check it out at my blog to see hw it's done! 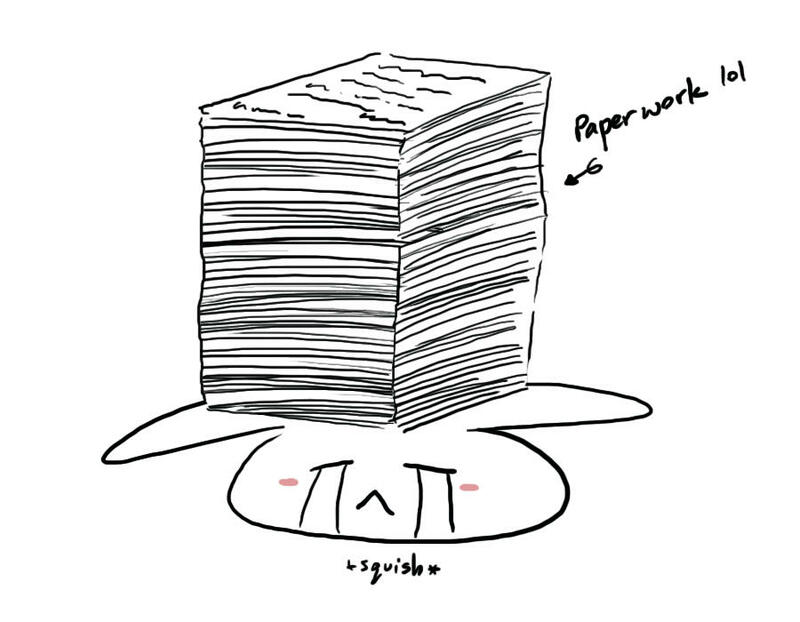 Currently I can relate to the picture of "papier work"! Glad you are doing fine ! how are things and you had a interesting post and glad to be here and I have updated two of my latest post for your info. I knew that this election meant a lot to a lot of Malaysians, but I didn't really know why. Thanks for the education. yay, so great to see you back! I completely understand where you were at when you wanted to blog but the words didn't quite come out—I'm glad that at least you didn't end up taking a ten month hiatus like I did when I stopped! I found this post on the Malaysian elections really fascinating; as someone who has spent a decent amount of my high school years debating US federal government legislation and election issues, it's interesting to see how elections in other democracies impact their societies. And you're totally right: who can know what the future holds? and that awesome 4 language tweet, what a fabulous country Malaysia is, I heard all about the election here from my friends back home! welcome back dear! I am actually from Indonesia and everything is pretty much almost the same here! You wanna keep your readers happy you know. Hi, babe, just dropped by to say hi. I was waiting for another post, but now I've realized that it's been a while again and then I thought "she must be so frigging busy!!!" Hope your work load is allowing you to breathe... Hang in there! hi dear, im happy im back in track! Lol.. lovely post dear..
btw, i nominated you for Liebster award dear..:)shiehshieh! Helloooooo berryyyy! Tehe! Sorry for replying late as I was stuck with my studies.. You know that right? It's seems like you were away too.. Haha! Missed you so much though and thanks for stopping by (: You are always a sweet heart! Nice post btw.. love reading it.. The animation above is cute indeed.. :3 Hope you visit me as well..